Funeral service will be held 11:00 am, Wednesday, April 17, 2019 at Lakeside Presbyterian Church in Duluth, Minnesota. There will be a visitation one hour prior to service, military honors accorded by the Duluth Honor Guard, interment at Forest Hill Cemetery. 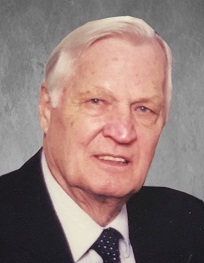 Walter Julius “Bud” Seaquist died peacefully in his sleep on Wednesday April 4, 2019. He was 98 years old. A lifelong Duluth resident he was born to Olaf and Julianna Seaquist on December 9, 1920. One in a long line of Walters, little Buddy played in the Teeny Weenie Band. On the first day of spring March 21, 1942 he married Agnes Mae Ross. They were married for 57 years and proud parents to Skip, Carol Jean, and Ronnie. In August of 1942 he joined the army, fought in WWII, and earned the Purple Heart. He retired from the US Postal Service after 30 years, but wasn’t much for sitting around. A great putter-er, he’d fix anything, often with found or re-purposed items. He went back to work driving bus for the DTA, then as a bailiff in district court. Bud proudly served as Past Master Lake Superior Lodge 349; Past Patron Lakeside Eastern Star; Captain ARAB Patrol AAD Shrine. While not effusive, he loved deeply. Bud and Aggie loved to go dancing and after he lost her, his special friend Edie Jankowski fell into step to the Big Band sounds while they could. 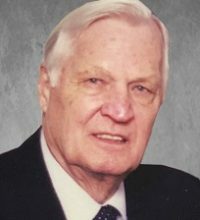 Bud played a special role in the lives of his grandchildren delighting in seeing them grow up and, in the case of Ross Young, follow him into the Orders. Preceded in death by sisters Alice, Evelyn, Justine and Virginia, sons Walter Ross/Skip , Ronald, infant daughter Barbara and granddaughter Julie Anne Seaquist. He is survived by daughter Carol (Ron) Brisbin, daughter-in-law Cathy Seaquist, grandchildren Ross (Elizabeth) Young, Mara (Todd) Falteisek, Joy (Matthew) Summers, and great-grandchildren Ella, Macade, Vincent, and C.C. Funeral Service will be held 11am, Wednesday, April 17, 2019 at Lakeside Presbyterian Church in Duluth, Minnesota. There will be a visitation one hour prior to service, military honors accorded by the Duluth Honor Guard, interment at Forest Hill Cemetery.